The candidates, who will participate in the UCEED 2018 Examination, are required to download the UCEED Admit Card 2018 before the examination date. The Indian Institute of Technology, Bombay will conduct this examination on 20th January 2018 and the admit cards for this test will be generated by 25th December 2017. 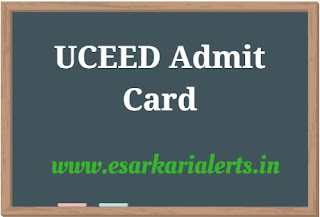 All appearing contenders can easily download the UCEED Hall Ticket with assistance of this page because the direct link to the admit card and few important instructions for the examination are mentioned on this page. The IIT Bombay will give this test on 20.01.2018 in the 20 Cities across India. The day of the examination is Saturday. According to the official advertisement the timing of the test will be 10.00 to 13.00. Contenders are required to reach to the examination center at the reporting time as per their admit cards. The complete official instructions regarding this examination are mentioned below. So, read this article with concentration. 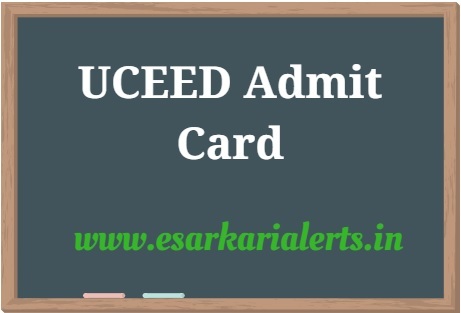 The UCEED Exam Admit Card will contain few important details for the examination likewise Name, UCEED Registration ID, Photograph, Signature, UCEED Roll Number 2018, Exam Timing, Test Center Details and other significant instructions. Dear candidates, if your admit card is not available to download then you should contact the Chairman, JEE (Advanced) UCEED & CEED 2018 at IIT Bombay immediately using the official contact details that are stated on this page. The UCEED is the short name of Undergraduate Common Entrance Exam for Design that is an entrance examination conducted to provide the admission to the selected applicants in B. Des at described Institutes. Applicants who had submitted their application forms for this exam they are now in the search of UCEED Hall Ticket. Here is an important information for the aspirants that after downloading the admit card, if there will be any discrepancy in the hall ticket then you need to contact the Chairman, JEE (Advanced), UCEED & CEED 2018 at IIT Bombay before 5th January 2018. All students are required to bring a printed copy of the downloaded admit card in the examination otherwise they will not be allowed to take the examination. Candidates will not be able to carry any electronic item such as phones, digital watches, calculator and other study material in the examination room. The complete list of forbidden times will be uploaded on the official website before the examination. It is must for the students that they remain in the exam room for the complete duration of the test. More vital instructions will be printed on the UCEED Admit Card 2018.